Scotty Hockey: 7-6-1: When Does It End? I can accept that Michael Del Zotto can't keep the puck in the offensive zone and passes to the other team as often as he does his own. I can accept that Derek Boogaard is a liability on the ice who's mistake led to the three-on-two that St. Louis scored on. I can accept that the Rangers get no favours from the officiating, it isn't like they are the Canadiens or the Penguins. I can even accept the fact that the Rangers blew a five minute power play for the second straight game. I can not accept the fact that a Ranger was hammered by a member of the opposition and NO ONE DID ANYTHING. As his teammates went for another of their poorly-timed line changes, Derek Stepan chased down the puck in the Blues zone and was railroaded by B.J. Crombeen. Dubi rushed over and let himself get picked off by a linesman while the other Rangers stood around. They stood around. Crombeen had four shifts on the ice after getting out of the penalty box and not a single Ranger went after him. Sure they would have gotten a penalty and threatened whatever slim possibility they had to tie the game but so what? So the hell what? A two minute instigator or even a early November loss is a infinitesimally small price to pay to show the NHL that the Rangers are a team. A team of honour. A team of pride. A team that fights for the city, the fans and for each other. But they're not. As I have no wish to spark the ire of any female or homosexual readers, I will avoid using the abundance of slurs that are appropriate for this bunch of Blueshirts but just know they aren't flattering. *The punchless Ranger play with the man advantage is sure to be a talking point but it is of little surprise. How can it be? 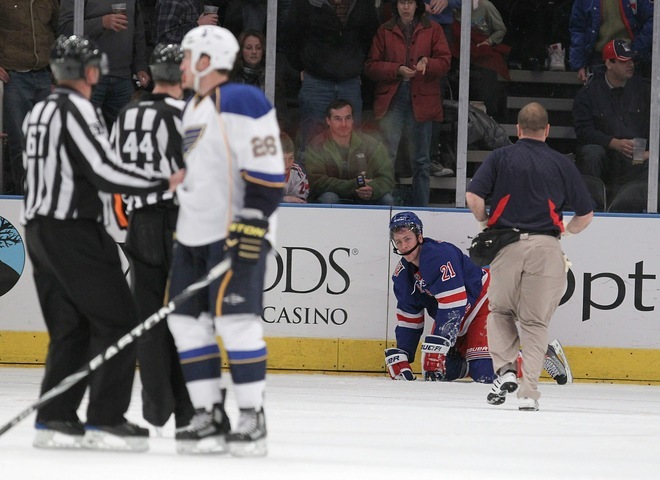 The Rangers actually carried the puck over the Blues blueline once during the five minute major. ONCE. The talent-less Rangers and their dump-and-chase philosophy depends on the team out-hustling the other team and winning battles. Well, J.D. built himself a largely talentless hard-working team that wins those battles. They are bigger and they are stronger and they play a helluva lot more determined. *Someone get Alex Frolov away from Sean Avery please. After Frolov tried - and failed - at a wrap around (shocker), Avery tried it twice. Ty Conklin isn't a very good goaltender, but he isn't a bad one. Even though New Jersey is a Mickey Mouse organization again, this isn't 1983. Halfhearted wrap-arounds rarely work so to use it every single time is utter stupidity. *Avery has one goal this season and took seven shots on goal. Brandon Dubinsky has 10 goals and had one shot. One. *For those that want to refute my earlier rant, saying that the two points are too important for someone to stand up for Stepan, well do you think that the coach really had the two points in mind when he started Marty Biron, a goaltender who had never beaten St. Louis in his career? You can't blame Biron for this loss, that is for sure, but it isn't like Tortorella is doing anything and everything to win. *MDZ was drafted 16 spots after Alex Pietrangelo in the 2008 draft but was playing in his 95th NHL game while Pietrangelo was playing in just his 30th, as St. Louis held him back a season. Well, J.D. clearly beats Glen Sather in this battle because giving Pietrangelo an extra year in junior has resulted in a much more complete, much more polished player. *At the faceoff dot the home side is allowed to get their stick down first, giving them an advantage. So how is it exactly that the Rangers were utterly dominated? They lost 38 of 54 faceoffs. That's pathetic and that allowed St. Louis to carry the play. David Backes, technically a right wing, went 11-1. *Geno Grachev's hard work and good timing nearly earned him a breakaway (that was broken up by a great defensive play). So, when the Rangers were desperate to create anything offensively, why wasn't he on the ice? Grachev played 4:10 in all, not a second of which was on the power play - one of only two Rangers not to get on the ice with the man advantage (Boogey being the other). Considering this guy was hyped as a big scorer that will make up for the loss of Alex Cherepanov who was supposed to make up for the loss of Jaromir Jagr, don't you think he should get a few seconds to show what he has? Grachev and Stepan are not being placed in a position where they can succeed when they are saddled with Boogaard on their line. *You know your team is wracked with injuries when Brian Boyle plays 16-and-a-half minutes, over three of which were on the power play. I know he has potted a career-high five goals this season, but let's get serious - it's Brian Boyle. *On a night where Derek Boogaard's former teammate John Scott utterly annihilated Zack Stortini, Boogey didn't drop his gloves; he punched a guy with them on and took a bad penalty for it. The one so-called fight in the game came between Brandon Prust and Tyson Strachan and it was over fast. It looked impressive in the Garden but, watching the video, I'm pretty sure Prust didn't land a single real punch until after Strachan actually slipped and fell. Damn shame. *Mike Sauer looked pretty good and he managed not to take a stupid penalty like Steve Eminger did but, when Torts decides to re-insert Matt Gilroy into the lineup any day now, it is safe to say he will take Sauer out. *Nice miss Arty. Anisimov tried to be cute and, instead of jamming the puck through the extended leg of Ty Conklin, butchered an open net after getting it to his forehand. *Ty Conklin was NHL on the Fly's Performer of the Night and the first star of the game, proving my theory that the professional media don't actually watch the game but instead glance at the numbers before making their decision. Conk made 27 saves but none of them were impressive. The Blues backup was barely tested and yet the MSM guys fawned over the shutout. 3-Marty Biron - 20 saves. 2-Alex Steen - two goals. 1-Ty Conklin - 27 saves. 3-TJ Oshie - Oshie looked like Ryan Callahan out there. High praise indeed. 2-Erik Johnson - The young American and his partner Eric Brewer played more than six minutes shorthanded and handily kept the Rangers away from the puck. Johnson has good size and good hands and, it seemed to me, has yet to tap his offensive potential. He ripped one point shot that was wide but his form was perfect. 1-Steen - Steen, technically a center, played alongside Backes and read off of the Olympian perfectly. While he will never be as good as his father, Alex does have some of the old man's instincts and got into the good positions that allowed him to score twice - once on a feed from Brad Boyes on the 3-on-2 and once in an empty net on a feed from MDZ. Whoops. I have no idea about the lack of retaliation -- is it b/c the players are fearful of taking "unnecessary penalties" or what? Dubi was really flying down the ice to get some revenge -- he almost got hurt by the linesman pulling him down. A donnybrook should have resulted with at least a couple of the other skaters. Callahan was the only skater who tried to create scoring opportunities without resorting to plays from behind the net or wraparounds. Unfortunately, he looked a little rusty as he messed up a couple of chances. Conklin played efficiently -- he left some juicy rebounds in front but no Ranger was there. In some ways last night's result was not surprising -- a tight checking team with a superlative GAA playing against an offensively-challenged team. 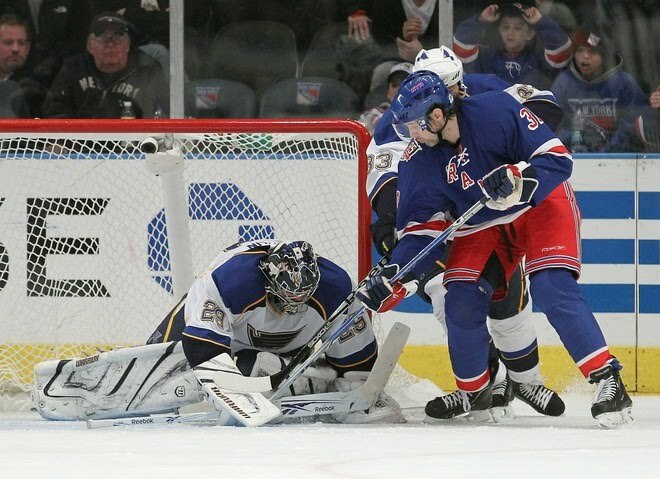 What is a shame is that Biron kept the Rangers in the game, so only one or two goals were needed but not obtained. The blown 5 minute power plays (two games in a row) were simply terrible. As usual, Scotty is right on with his game analysis. Thanks man for properly addressing my loyal anger and frustration with the Rags. You are completely correct, it was annoying listening to them whine about the missed goal. That didn't cost the Rangers 2 points, lack of heart did.